Found the topiary forms on clearance a while back. The little urn came from a thrift store. 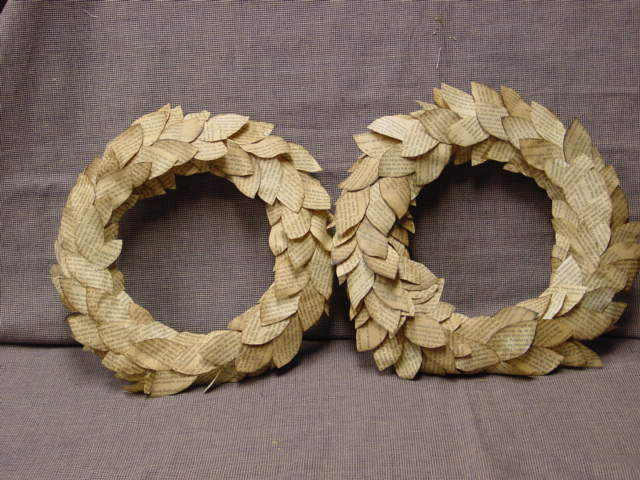 I hand cut the leaf shapes from old book pages. Did an entire book over the course of a week or so while I watched TV in the evening. Can’t do too many at a time or I get blisters and/or hand cramps! To ‘tea stain’ the leaves, I use my own stain recipe (NOT made with coffee or tea – they get too stinky!) Turn oven on to LOWEST temp. Take a cookie sheet and spray it down with water (so leaves will stick in place) Place paper leaves on cookie sheet and spritz with stain. Put cookie sheet full of leaves in oven and turn over OFF. There will be enough heat to dry the leaves in about half an hour. I had to saw off (using a serrated kitchen knife) some of the base of the topiary to get it to fit my container. Glued it into the container and then on to the leaves. 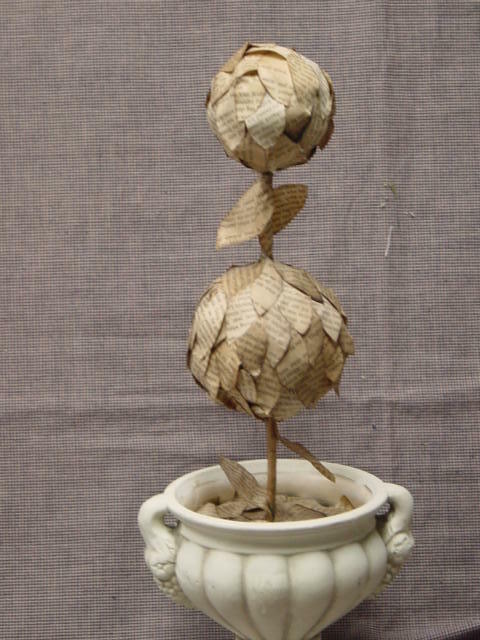 Using a hot glue gun, glue the leaves on, one by one, until your topiary ball is fully covered. 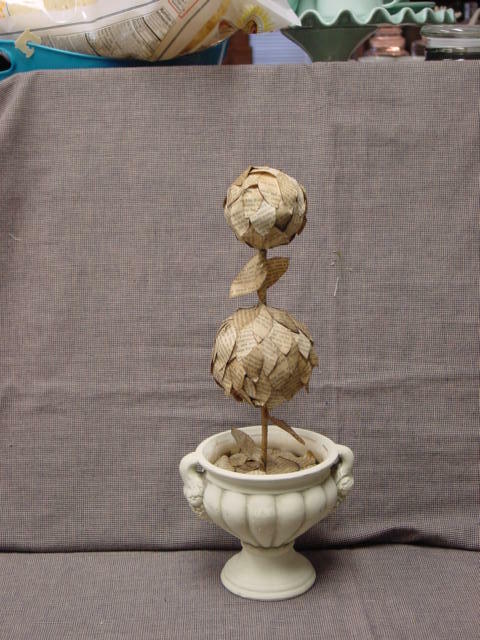 I also glued leaves over the top of my topiary base, in the container. You could use moss for this, I just wanted to try it with leaves. I’m sure everyone already knows this trick, but just in case you haven’t used your glue gun in a while (like me!) and have forgotten; to remove those pesky glue ‘hairs’ that are always left behind after using your hot glue gun, just give your item a once over with a hand held hair dryer set on hot, and they will disappear! 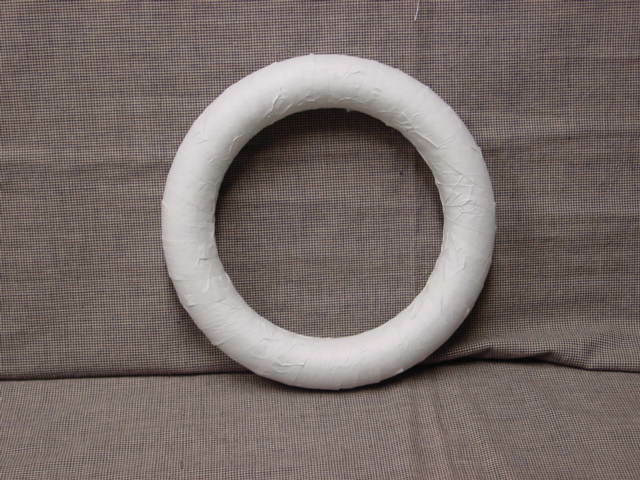 Glue does not stick well to styrofoam, and HOT glue will just melt it. 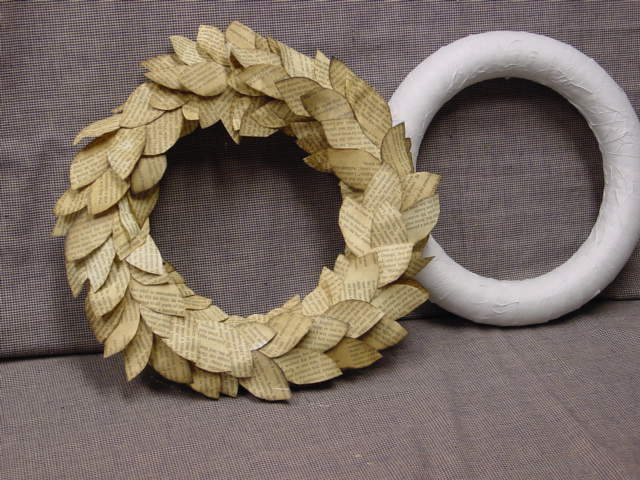 (they do make a special styrofoam glue, but it’s pricey and I’ve not tried it) So I cover my wreath with newsprint paper first. 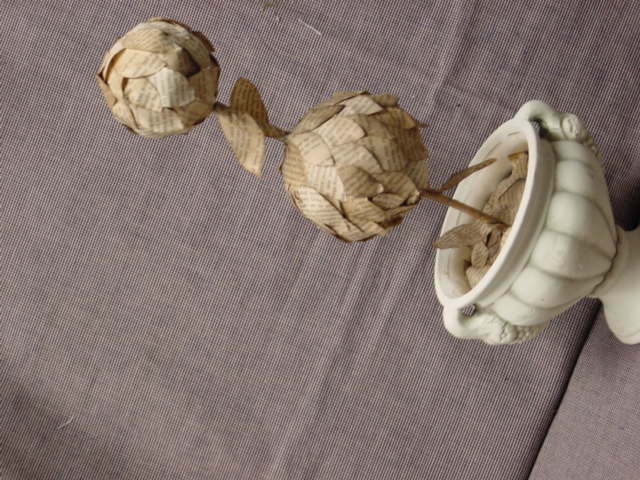 ANY kind of paper will work, I just happened to have some newsprint packing material leftover. 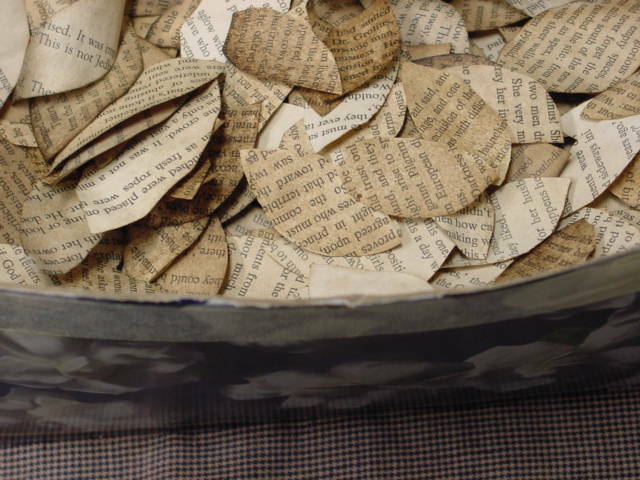 Cut or tear your paper into strips. I glued mine on with tacky glue. Just be sure your entire form is fully covered with paper. Glue your leaves on using a hot glue gun, all going in the same direction. I usually end up doing 3-4 leaves across; and I do NOT cover the back with leaves, since it really won’t show. 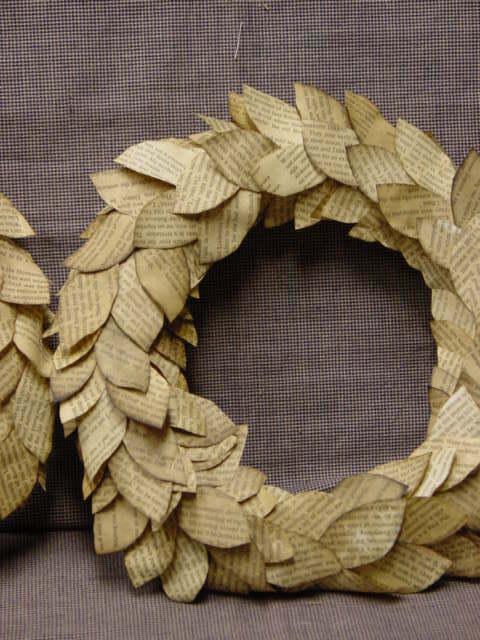 The paper leaves ‘curl’ a bit when they dry in the oven, and variegate a little in color; which creates a very natural look. 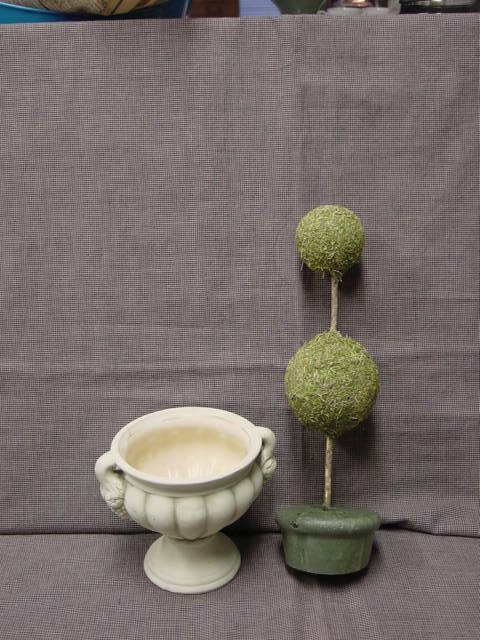 The neutral color of these pieces make them perfect for year round display and work well in any color palette. Love it! So cute. Not sure how one I would do would look?? !